All the managemental practices before brooding or before receiving the chicks in other sense various measures, which we provide in preparation for new-hatched chicks arriving at our farm. 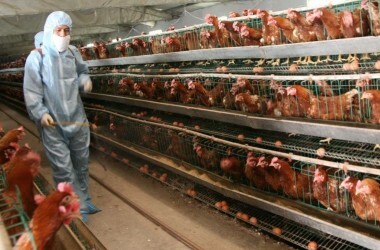 We will study different factors, which play very important role in the process of pre-brooding management and main purpose of this process is to avoid different diseases, which cause great economical losses due to poor managemental practices, Prevention is most and best economical method of disease control. Prevention is best achieved by the use of sanitation and biosecurity programmes. a) It reduces number of pathogenic organisms. b) Remove material that helps in multiplication of pathogens. c) Expose surface to the disinfectant and fumigants. In the process of pre-brooding management following measures are generally considered for taking good results. Most important factors, is the selection of area in the shed .The house should be cleaned and disinfected, immediate preparation is necessary so that the building may lie empty for one to two weeks prior to placing new chicks in them. Disinfection and fumigation will kill most of the disease-producing organisms. An empty house will break the life cycle of pathogens. This process reduces the chances of infection and if shed fenced around property it will save birds from predators. At least 80–100 feet away from other sheds with minimum traffic is suitable. There has been increasing numbers of objections from residence near poultry sites claim that they suffer nuisance to the quality of their lives but also causes ill health. Good ventilation and environmental conditions will greatly help in reducing smell. Good management of environment is best way to reduce complaint smell and manure. There is no hope of overall hygiene process being fully effective if there is any much left in the house. There are basics flaws in the construction allowing penetration of the structure by the pathogens for example previous services, poor protection of joints wear on floors and inaccessibility of certain parts such as ventilators. The cleaning process must involve following. Old litter should remove from the poultry house if it is piled near the house, rats and vermin may carry the residual disease back into the house. All equipment must be washed with Kmno4 and disinfected .The equipment should be moved outside the house in sun an area inside the fenced enclosure to complete the cleaning process. The equipment should be moved back into the house. Remove dusty walls and ceiling with moderate volume of water. Using boiling water is most effective and economical method for disinfection purpose. Unused feed should not hold over from one brood of birds to the next feed bins and feeders should be completely cleaned. Once litter has been removed the next priority should be removal of numerous spider web that bloom here and there on walls, flying birds often enter in the sheds and build nests in ceiling, these should be removed. During this period done all the repairing work like repairing work of gas pipes, brooders, electricall equipments, windows and doors. Wash ceiling walls floor with generous amounts of water. Preferably add some detergent to wash house. Next all cracks crevices in the wall floor or ceiling should be filled up. All leakage in the gas pipes or water pipes should be sealed, electric short circuit should be corrected and fuse etc should be replaced. A basic essential is that disinfection programme must be most carefully planned. The disinfection of a building implies the elimination from the house all microorganism that are capable of causing disease. Follow the manufacture instruction carefully and make sure that the disinfection has proven active against the pathogens. This is the very important procedure to give a final boost to the disinfection programme, at this stage the house is setup ready for the next crop for this purpose formaldehyde gas is most suitable. The shed should be properly sealed before fumigation 17.5 gram Kmno4 and 35 CC formaline can be used for fumigation. Put the litter in the selected area, there should be ample supply of relevant material e.g rice husk, saw dust litter should be economical, comfortable and absorbent, saw dust may be from hard wood or soft wood while using for chicks soft wood saw dust should be used because hard wood contains tannin which will be eaten by chicks and result in high mortality due to vent pasting .Try to cover saw dust by newspaper or paper so that chicks cannot eat it in the beginning. For starter you may use ground maize, which is easily digestible and due to its high fiber content reduce pasting problem. It is a good source of energy. In case you are using kerosene oil, wood or coal burning brooders, you should have stocks of relevant fuel. Never forget the functional capability of your brooders. The burners should be controlled properly. The gas or electric supply should be proper. Following precautionary measures may be undertaken at the arrival of chicks. i) The chicks should be arrive early in the morning so that you have full day to observe them and take care of them. ii) Place the chick guard (2-3 feet from the edge and increase area weekly this will reduce cannabalism and increase feed utilization. iii) Do flushing at start for this use 250gm sugar/gallon of water, which is mixed to provide carbohydrate to chick and clear the digestive tract. iv) Use ground maize for 2-3 days for feeding because it contains more fibers, which is easily digestible. · Tribrisin 1 c c/gallon of water. · Erythro F.Z 4 tea spoon/gallon of water. · Oxytetracycline 11% 125 gm/gallon of water. vi) Brooder temperature should be kept at 90-95F each week and don’t go less than 75F.This temperature should be recorded at the height of about two inches above the litter on the outer edge. vii) Farm manager should be present and ever alert, count the number of the chicks, closely regulates temperature of shed and of the brooder and above all observes closely, all requirements of birds.